Asabogue’s Mayor Lois Leibowitz passes an ordinance to ban guns in the town—right in Otis Cogsworth’s backyard. Otis retaliates by orchestrating a recall election against Lois and Jack Steele, a rich town resident, runs against her. Even though the election is for the mayor of a village on Long Island, Steele brings in the big guns of American politics to defeat Lois: political consultants, Super PACs, and celebrities. Soon, thousands of pro-gun and anti-gun partisans descend on Asabogue, along with an assortment of heavily armed rightwing militias and the national news media. Bucolic Asabogue becomes a tinderbox. Meanwhile, Washington politicians in both parties are caught between a mighty gun lobby whose support they need for reelection and the absurdity of requiring that every American with waivers for children under age 4 – carry a gun. What ensues is a discomfiting, hilarious indictment of the state of American politics. "New York congressman-turned- novelist Israel delivers a second brilliant political satire…, this time targeting the firearms industry and the Washington political establishment… Promise readers that the only way they will put this book down is when Charlton Heston’s ghost pries it from their cold dead hands." "A former U.S. congressman takes on the gun industry and a big slab of American politics in this entertaining satire. Israel recalls Carl Hiaasen and Christopher Buckley in their liberal bents and sense of the perniciously absurd." 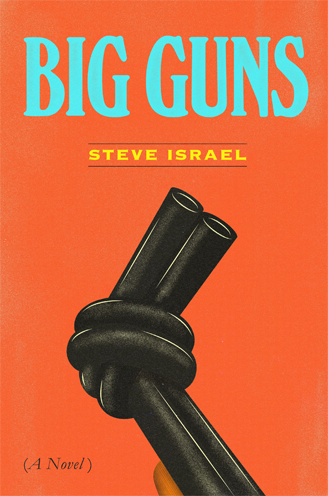 "Israel’s second novel (following The War on Morris) is a wonderfully irreverent satire about the fractured and fractious American political and lobbying system….This clever political farce exposes the extremism of the gun rights issue, both pro and con, with a smart plot, loud, noisy characters, and hilarious dialogue….It’s a rollicking comedic trip." "Former Congressman Steve Israel, the only funny thing to come out of Washington in a long, long time, hits the bulls-eye. Hilarious and ingenious—and pleasingly wicked." "This book delivers what America needs now more than ever—a good laugh at ourselves. Big Guns is a satire about the gun lobby, political corruption, and Washington power, but it is more than the sum of its parts; it’s a serious indictment of America, told by a man who has spent sixteen years in Congress and knows of what he writes. Steve Israel is not only a fine writer, he is perhaps the finest, funniest, and best political satirist writing today. You don’t need to completely agree with him (I don’t), but you need to hear what he has to say. Congress should pass a law making Big Guns mandatory reading for themselves." "Big Guns is a knowing, witty, dark look at the madness that has overtaken American politics. A former Congressman, Steve Israel knows his subject. One of the most gifted acrobats has left the circus, picked up a laptop and blown the cover off the big top. Defying gravity, he somehow makes us laugh at the outrages and absurdities of Congress, campaigns, and the media." "Wow! Another great book from Steve Israel, this time a timely satire about a very serious subject. Something's got to get us to change. Maybe this will." "Honestly? It irritates me that Steve is such a terrific writer. To have his political insight and wisdom, and then, on top of that, have the skill to spin it into something so uniquely his own, with comedic timing so crisp, rhythmic and musical—and funny!—seems, frankly, unfair. Big Guns is a great, and timely, read." "Writing in the full-tilt style of Carl Hiaasen" (The Washington Post), this jaundiced political satire was ripped from the headlines and penned by an author who's met the characters, heard the conversations, and seen the plot twists firsthand. Meet Morris Feldstein, a pharmaceutical salesman living and working in western Long Island who loves the Mets, loves his wife Rona, and loves things just the way they are. He doesn't enjoy the news; he doesn't like to argue. Rona may want to change the world; Morris wants the world to leave him alone. Morris does not make waves. But one day Morris is seduced by a lonely, lovesick receptionist at one of the offices along his sales route, and in a moment of weakness charges a non-business expense to his company credit card. No big deal. Easy mistake. But the government's top-secret surveillance program, anchored by a giant, complex supercomputer known as NICK, thinks differently. NICK begins to thread together the connected strands of Morris's life—his friends, family, his traffic violations, his daughter's political leanings, his wife's new patients, and even his failed romantic endeavors—and Morris becomes the government's public enemy number one. In his "laugh-out-loud funny" (Chris Matthews) debut novel, author "Steve Israel reveals his inner Jon Stewart" (Daily News, New York). 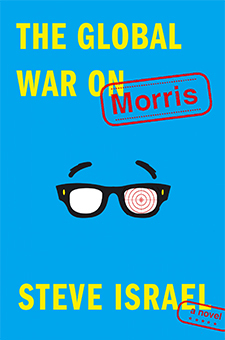 The Global War on Morris toes the line between recent breaking headlines and a future that is not that difficult to imagine: "Why read this when one can see Washington insiders acting like buffoons in farcical situation on CNN? This is funnier than Wolf Blitzer, that's why" (Library Journal). 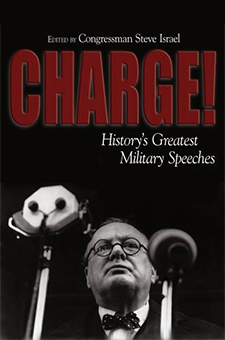 One of the leading voices on national security issues in the U.S. Congress demonstrates how words have been sharp and powerful weapons of victory in this compilation of great military speeches that helped turn the tide of history. Among the dozens of inspirational speeches featured are: Moses instructing his followers to cross the Jordan River without him…Queen Elizabeth pledging to die with her soldiers as they faced the Spanish Armada…Patrick Henry choosing between liberty and death…Napoleon exhorting his troops as they marched on Egypt…Winston Churchill rallying his nation to victory…General Sir Montgomery refusing to retreat from Rommel…President Roosevelt preparing the American people for World War II…General Eisenhower fortifying his troops for the invasion of Normandy…President Reagan demanding that Gorbachev tear down the Berlin Wall…President George W. Bush encouraging America after 9/11…and more. Congressman Israel has included speeches that have motivated and mobilized, challenged and comforted. Some were blurted in the heat of combat, others were carefully written in places far removed from the brutality of the battlefield, but all will inspire readers with the courage that moved people forward against all odds. Each speech is introduced with an insightful historic context. This dramatic sweep of military history in the words of history's military leaders serves to reinforce the concept that the pen is mightier than the sword. Galloping to Freedom: Reuniting the Adobe Town Appaloosas Playful. Protective. Dignified. Elegant and affectionate. Certainly beautiful. Above all else, loyal. These are the horses of Wyoming's famed Adobe Town herd, their stunning images caught in the wild by award-winning photographer Carol Walker. Especially remarkable are the snowcapped stallion that Walker thinks of as Bronze Warrior and his band of Appaloosa-marked mares and offspring. But their freedom was to be curtailed. In the fall of 2014, the Adobe Town horses were rounded up, their bands divided. Bronze Warrior and his sons were shipped to Colorado, their mares to a holding facility in Wyoming, and their young sent to Carson City, Nevada. Moved by the horse's strong family bonds in the wild, Walker joined with other advocates to intercede. This is the story captured in Walker's signature dramatic images of searching out, gathering together, and ultimately reuniting Bronze Warrior's extended family at the Black Hills Wild Horse Sanctuary. 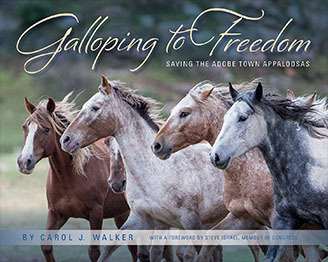 Galloping to Freedom: Reuniting the Adobe Town Appaloosas will engage your heart and forever change your view of America's wild horses. With a Foreward by Steven Israel, Member of Congress.